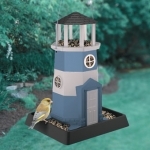 This captivating building cupola bird feeder was inspired by early American architecture and will add to any patio, porch/deck or backyard. Part of the Heritage Collection. 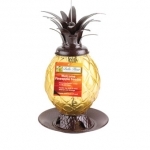 Round Feeder holds over 2qts (approximately 2.8lbs.) of seed. Roof lifts off for easy filling and cleaning. Sturdy cable hangs easily from any hook or hanger. Square Feeder holds over 5qts. of seed (approximately 6.3lbs.). Roof has a large opening for easy filling and cleaning. A large tray provides perching area for multiple birds to feed at once. separately. 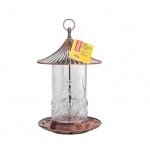 Attractive feeder holds two quarts of seed and the push button top makes it easy to clean and fill. It has a built in seed diverter and drainage. Top Locks securely to prevent squirrel access. Post mount. Heavy duty hanger included. Durable, chew-resistant powder coated steel body. Easy to fill and clean. Large capacity holds 4lbs of seed. 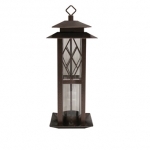 The Heath metal decorative butterfly bird feeder holds up to 3 lbs of mixed seed. 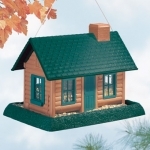 This decorative feeder has 4 feeding ports and a built in perch. 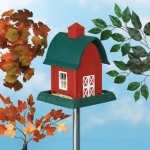 A mixed seed bird feeder that is as beautiful as it well constructed. Made of hammered steel. 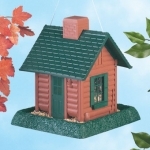 This copper-colored, 2lb mixed seed feeder will be a focal point in any yard and blend with any decor. Built with a catch tray to help minimize spills. Part of an extensive Village Collection of feeders. 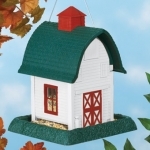 This feeder is reminiscent of a country red barn with white accents and a green roof. Part of an extensive Village Collection of feeders. 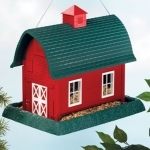 This barn-style feeder has white sides with red accents and a green roof. 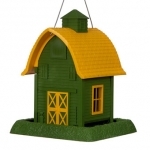 Village Collection Birdfeeder is a beautiful addition to your lawn, deck or garden. 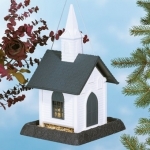 Can be used hanging or on pole mounted on North States Model 1756 Pole set (sold separately). Hold 5 lbs. of regular or sunflower seed. Fills through lift off steeple. Measures 10.25in. x 9.5in. x 16.25in. high. Part of an extensive Village Collection of feeders. 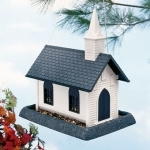 This authentic church feeder holds 8 lbs. of seed and features arched windows on two sides with clear plastic panes to monitor seed levels. Part of an extensive Village Collection of feeders. 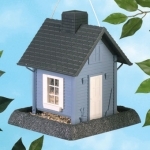 This cozy cottage feeder has blue siding and a gray roof. Part of an extensive Village Collection of feeders. 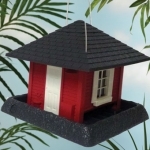 This charming cottage feeder has white siding, a red door and a black roof. Part of an extensive Village Collection of feeders. 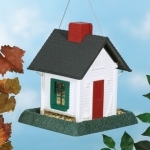 This feeder resembles a small garden house with red siding, white accents and a gray roof. Part of an extensive Village Collection of feeders. 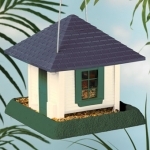 This feeder resembles a small garden house with off-white siding, green accents and a gray roof. A new nautical series of birdfeeders within the Village Collection. 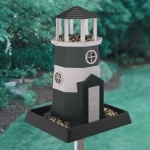 This feeder resembles a miniature lighthouse with black and white siding. A new nautical series of birdfeeders within the Village Collection. 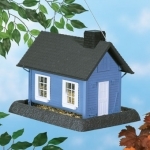 This feeder resembles a miniature lighthouse with blue and white siding. Part of an extensive Village Collection of feeders. This unique log cabin has the capacity to hold 5 lbs. Part of an extensive Village Collection of feeders. 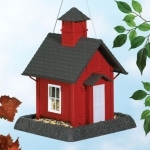 This charming school house feeder has red siding and a gray roof. 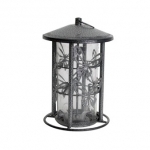 Decorative glass seed chamber embossed with butterfly. Beautiful brushed copper finish. Large perching tray for many birds to perch and feed. Holds 2.3 qts (approx. 2.9 lbs.) of seed.